The use of technology at Central Catholic is a cornerstone of the educational experience. Technology serves as an invaluable tool that facilitates learning, and technology is also explored as a subject area in our curriculum and through co-curricular activities that include the Coding Club and the Robotics Team. Find your favorite comfortable spot on campus and fire up your iPad, tablet, laptop or Kindle. Then grab your friends and get to work sharing video, music and messages for your upcoming group presentation, do research through the web, access the paper you started at home or download your favorite novel almost anywhere on campus, because CCHS is wireless! No more heavy backpacks! All of our students are using iPads with e- and i-books for their courses. Can you imagine going into your mathematics class and scanning a QR code projected on the white board to download the notes for the lesson, or performing a virtual frog dissection in biology on your iPad? Why imagine it – it’s happening now! 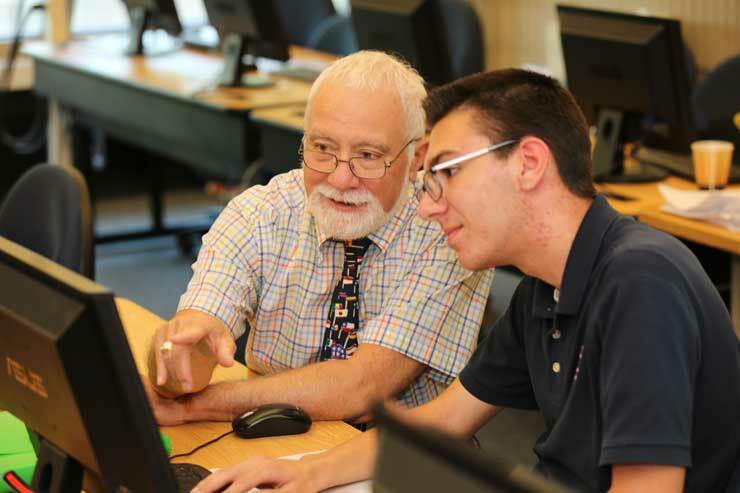 At CCHS, we are proud to be one of the first schools in the area to utilize technology to its fullest by enhancing the teaching and learning experience. Click here for more information on our iPad 1:1 Learning Environment. Through the generosity of an anonymous alumnus, CCHS offers an annual competition, open to students in all grades, with the opportunity to earn a $12,000 scholarship applied to their CCHS tuition account. The scholarship is individually awarded to one student judged to have best demonstrated an innovative or unique application of technology to any field, including but not limited to: art & design, software design, multimedia production, engineering or internet use. A representative committee of CCHS faculty & staff evaluates and judges eligible projects and awards the $12,000 Innovators Scholarship to the winning student.